My current filming set up. I never intended to bolt a load of crap to my camera for video blogging. I didn’t see the point. For me the phone meant simple, lightweight, always ready image grabbing. Back in the day the add-ons weighed a ton and bulked your phone up so much you may as well have taken an SLR out. Also the best clips I grabbed were impromptu captures. Snatches of passing moments. A reach for the pocket, the opening of and app and you are good to go. My phone was for vlogging and my SLR for ‘real’ work. That was before the phone became accepted as a serious video capture tool. Before people realised what was possible with a mobile device. I’ve been fortunate in the past with clients like Reuters and the Open University. Back in 2008 Mike Sizemore and Ilicco Elia roped me into an experiment that for the first time let bloggers loose with their devices amidst some interesting political conversations. While around the same time at The OU Ian Roddis asked me to “Just walk around with your phone and film stuff.” They got it. And with my Nokia N95 I found I could easily capture and share in realtime. Delivering that ‘stuff’ and only occasionally raising an eyebrow. I still felt I needed to invest in the heavier gear. Mostly for low light or raw images. Or as a back-up to my phone if it was live streaming. Or to look more important to those not yet in the know. But more and more I started leaving the heavy duty gear at home. Venturing out with my phone and a couple of pocketable accessories. 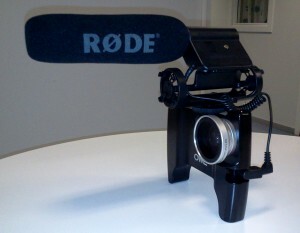 Initially a Rode Mic and my Ollo Clip Case + lenses. Occationally a home made rig. In perfect conditions the phone on its own is more than enough. Perfect meaning a brightly lit space with zero wind and no background noise. Preferably after avoiding caffeine for two straight days. For all those other times I’ve come round to how handy a grip or basic rig can be. Just the act of setting up your device can put you in a different frame of mind. Attaching a grip and a mic reminds you there is work to be done. I Well shooting professional video on a phone is becoming the norm in some fields. And hopefully we will see more stuff like the recent announcement from Olloclip. If you are considering some kind of grip system for your phone you need maximum functionality in a small form factor. This set up appears to do it. Looking at the price of £69.99 I’m already considering how their new ‘Studio’ will fit into my workflow. I have not seen the kit close up but I’m a big fan of their standard case. It’s used every day with or without the lenses. It’s well made and feels great in the hand. The new case looks a little more heavy duty. Slightly thicker with it’s new rail-mounting system. I should list some other rigs on the market but little excites me at this price point. Outside of assembling my own, this is the first time I’ve taken a second look at a complete mobile video solution. 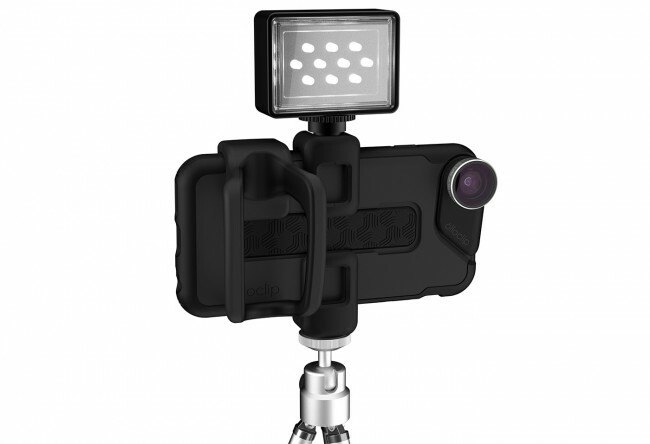 The protective case with integrated mounts will take a selection of modular accessories. Up until now most of these kinds of rigs have made your phone as heavy as an SLR. Take the Owle for example. I know this was really popular back in it’s time but maybe only through lack of choice. It’s crazy heavy. When I had a play it felt more cumbersome than helpful. Like trying to work with a phone stuck to an anvil. Our devices are continually updating their shapes, size and port locations. It makes sense that accessory designers are simplifying their approach and pricing accordingly. I’m more likely to invest in an £70 rig every other year than a £200 one. Initially designed for the iPhone 6 the Olloclip Studio appears to be aimed at all types of image makers. Still or video. Amateur or pro. I’m not sure why you’d need a complicated set up for stills photography. I feel the iPhone does really well as is. But that’s just me. I’m guessing those into landscape photography may need a tripod mount etc. For the happy snapper or street photographer contending with low light, keep your feet shoulder width apart and elbows in. If you don’t have additional lenses zoom with your feet. Never with digital zoom. When you need a wider angle or can’t get closer then additional lenses are handy to have. I’m wondering if Olloclips innovative (pat pending) rail-mounting will hinder any hackability. Especially with third parties offerings. Looking at their existing eco-system it appears pretty flexible. A two-finger grip. Cold shoe adaptors. A standard 1/4-20 Tripod/grip mount and a viewing stand. It’s a formidable looking set up. Especially if you already have a favourite mic and light in your kit bag. Will I be retiring my current set up? Will the case play well with my Røde Mics? Looks like I’ll have to wait till February to find out. 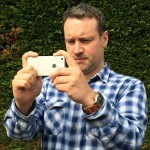 I’ll be sure to blog about it and link to Twitter via @Documentally. Or maybe I’ll drop a 10,000 word review straight into the new Twitter. 😉 But I doubt it. 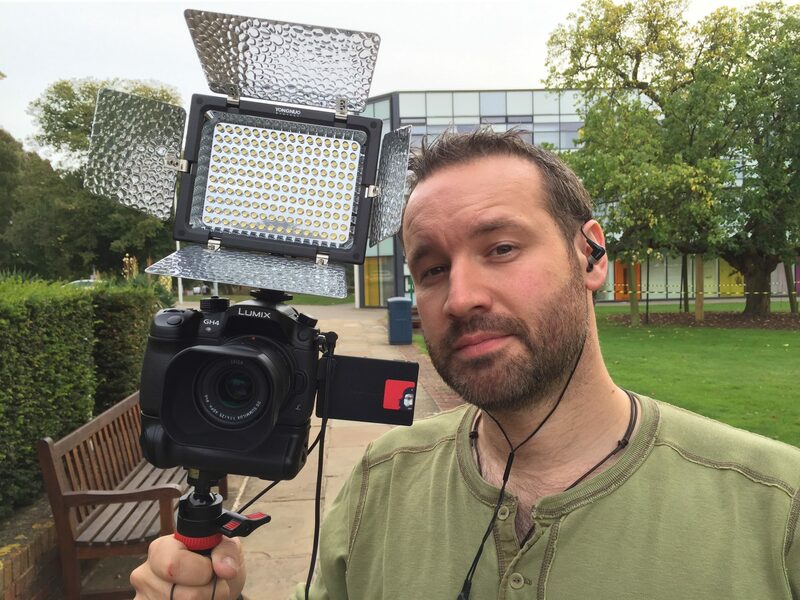 I’m interested in seeing other people’s set ups and how they use their devices for filming. Please feel free to comment below. With everyone shovelling content into Medium or Facebook I feel personal blogs could do with a little love. I’m hoping that should I die before Richard Mackney he’ll at least continue to host my blog till he cops it. By then perhaps Archive.org may have scraped these pages so future generations can read about how we busied ourselves bolting stuff to our phones so we could film stuff better. I run workshops on audio, video, stills and other creative communication solutions. Subscribe to my newsletter at Documentally.com/newsletter for the latest. Was Reuters really as far back as 2008? I still miss my Nokia handsets from that era, and coincidentally the closer blogging community that was easier to tap into at the time. Thanks for the comment. I just saw the new Nikon D5 is over £5K. It’s crazy to go SLR i feel when if you really need the lenses and speed Micro 4/3rds is much cheaper. 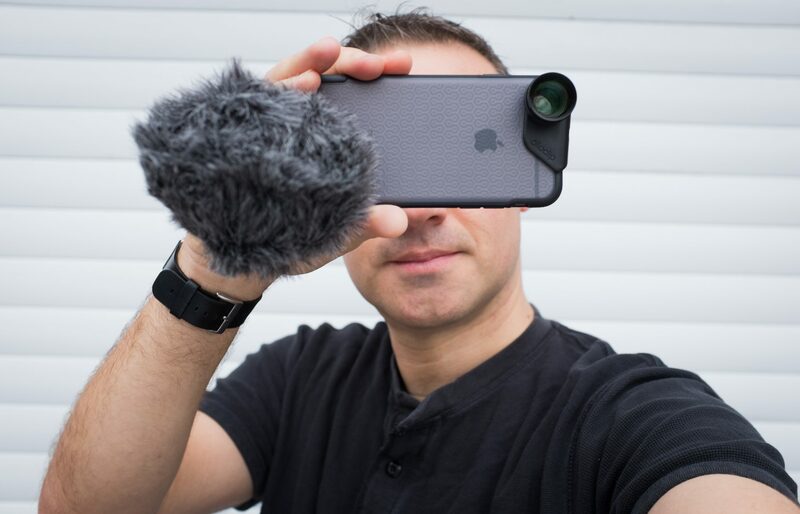 Last week I brought out my iPhone 6S Plus and the recently acquired Rode VideoMic Me (purchased on your advice via Twitter) in front of a client. They were used to me using my Nikon gear, Rode mics, etc. Needless to say they were gobsmacked at the quality produced by the phone and mic. I also used the SmartLav+ for a staff member’s piece to camera. But I have to say, apart from the snobbery shown by some if you get a phone and mic out, the final product is great. My only issue is handling the phone and mic and this is why your post here picked my ears up and opened my eyes. I haven’t found a decent, lightweight rig for it yet. I also use a small LED light for the phone and haven’t been able to attach it. I suspect I’ll be using the Nikons’ more for just the photojournalism element in the future and relying more on the iPhone and Rode mic for some commercial/client work. Post when you know more. I still enjoy taking my Fujifilm X100t out for stills. Not that I do anything much with the photos I shoot for myself. It’s partly romance for the old ways and occasionally feeling I need that extra bit of image quality. And I still look at Leica bodies that take manual M lenses. Waiting for something that is networked. Something that enables me to share in close to realtime. I keep saying i’ll never buy another ‘proper camera’ but i’m learning to never say never.